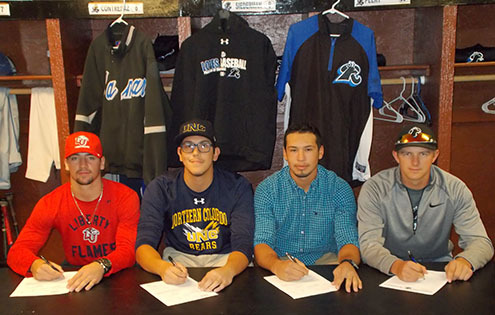 Four sophomores from the Lamar Community College (LCC) Baseball team signed national letters of intent to play NCAA Division I & II baseball on Wednesday, November 9. LCC Head Baseball Coach Scott Crampton announced that third baseman Ayden Karraker, signed a national letter of intent with Division I Liberty University. Pitcher Carter Chacon signed a national letter of intent to play for the Division I University of Northern Colorado. Catcher Draven Adame signed a national letter of intent to play for Metro State University of Denver. And pitcher Darin Cook signed a national letter of intent to play for West Texas A & M University. Ayden Karraker, a 5' 11", 185 pound third baseman from Horizon High School (Thornton, Colorado) signed with Liberty University. Karraker started every game at third base as a freshman while finishing third on the team in hitting at a .356 average with 36 RBI and six home runs. Last season Liberty University finished 31-28 overall and 12-12 in the Big South. The Flames lost in the Conference Title game to eventual National Champions Coastal Carolina University. Carter Chacon, a 6'3", 230-pound pitcher from Valley High School (Evans, Colorado) signed with the University of Northern Colorado after pitching 19 innings and finishing 1-2 as a freshman. Chacon is a professional prospect and has a good chance to be drafted this June. UNC finished 16-34 and 11-12 in the WAC Conference in 2016. Northern Colorado lost to University of California Bakersfield in the WAC Conference Tournament at the end of the year. Draven Adame, a 5'11", 190-pound catcher from Lamar High School (Lamar, Colorado) signed after batting .333 with 22 RBI and two home runs as a freshman. MSU finished 17-23 overall and 13-17 in the RMAC in 2016. Adame will have the privilege to play his home games on the beautiful new twelve million dollar MSU athletic complex. Darin Cook, a 5'10", 185-pound pitcher from Walsh, Colorado, graduated from Lamar High School and has signed with West Texas A & M University. Cook finished his freshman year with 30 innings pitched and a 2-1 record with seven saves. WTAMU finished 36-20 overall and 21-14 in the Lone Star Conference in 2016. The Buffalos have had three straight appearances in the NCAA South Central Regionals. In 2016 WTAMU lost to Lubbock Christian in the NCAA Regionals in Grand Junction. "I am very proud of these young men. They were a big part of our success last season and will be leaders on our field as sophomores. They are men of great character and will be a big impact to their future programs. It is also exciting to send former Lamar Savage standouts Draven Adame and Darin Cook on to continue their careers," commented Coach Crampton. For more Lopes Baseball, visit golopes.com. Photo (left to right): Lopes Baseball early signees Ayden Karraker, Carter Chacon, Draven Adame and Darin Cook.